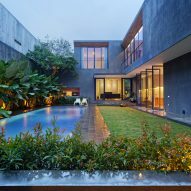 Rows of pivoting glass doors can be opened to allow air to flow through living spaces that open onto courtyards, terraces and lush gardens at this house in the Indonesian city of Semarang. 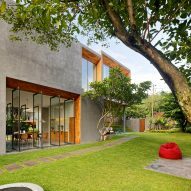 House of Inside and Outside is the first project designed by architect Tamara Wibowo, and was developed as a home for her young family in the port city on the north coast of Java. 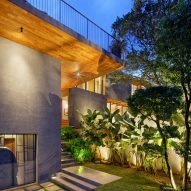 The house is located on a corner lot in a hilly neighbourhood. 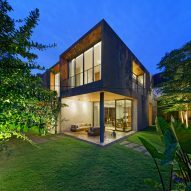 The architect claimed her main intention was to create a 600-square-metre home that doesn't feel too big and makes effective use of the site. 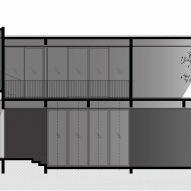 The property comprises a series of grey concrete blocks that are each dedicated to a specific function. 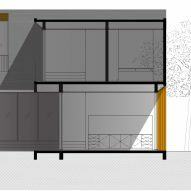 One volume houses the living areas, another the office and garage, and the final contains the service quarters. 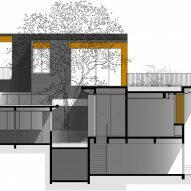 At the centre of the plan is a void containing a mango tree that has been growing on the site for decades. 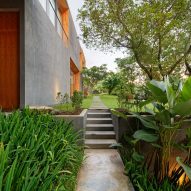 The tree was left undisturbed and marks the position of the entrance, which is covered by a bridge connecting rooms on the upper floor. 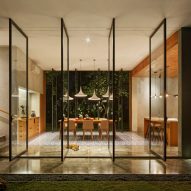 The entrance leads directly into a kitchen and dining area lined on both sides by glass doors that pivot open to allow air to waft through the space. 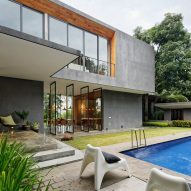 By seamlessly connecting indoors and outdoors, Wibowo's design provides a range of comfortable spaces that can be used year round in this tropical climate. 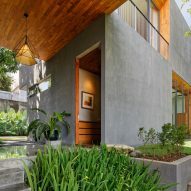 "The house focuses on creating a sequence of experiences that brings the focus back to nature through spatial overlapping of indoor and outdoor rooms and presence of light coming through skylight and large openings," the architect explained. 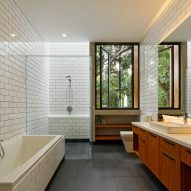 A short set of steps leads up from the tiled dining area to a lounge connected to an open-air patio sheltered beneath an overhanging corner of the first floor. 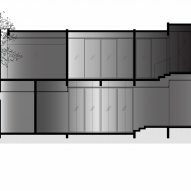 All of the main living spaces can be opened up to the central yard, which contains a lawn, swimming pool and several seating ares. 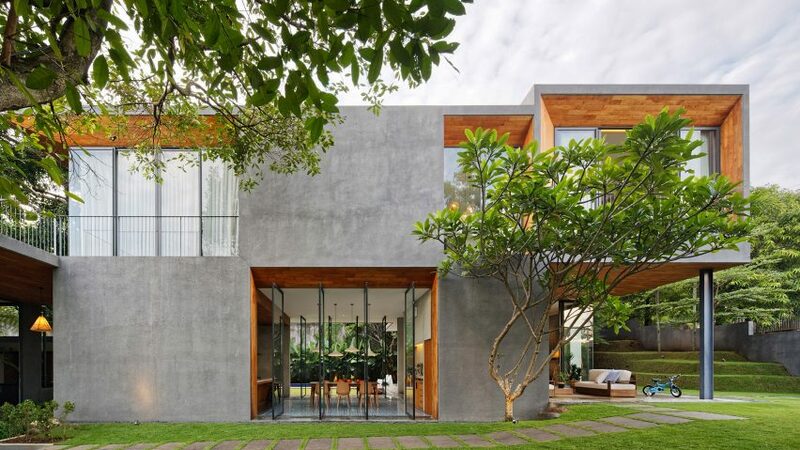 Budi Pradono's leaning house in Jakarta built as a "symbol of anti-establishment"
The large, recessed openings containing windows and doors on both levels of the house are lined with warm timber that contrasts with the cool grey concrete of the facades. 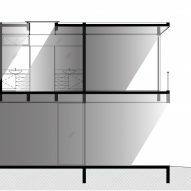 The materials used both externally and internally are kept in their raw state to maintain a sense of architectural honesty. 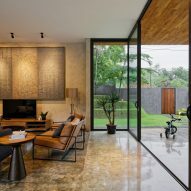 Built-in furniture throughout the interiors helps to create a clean and uncluttered feel, with teak wood joinery, polished-concrete flooring and exposed plaster on the walls introducing various tones and textures. 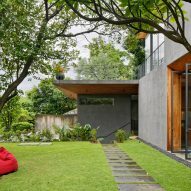 Photography is by Fernando Gomulya.